I feel like I’m becoming some sort of point-and-click adventure game expert. I’ve played so many of them over the past couple of months. This may be a good thing, but it also might be warping my brain in the worst ways. We shall see. Daedalic Entertainment is firmly entrenched as one of the leading developers of point and click adventure games. Hot on the heels of Night of the Rabbit—a charming nostalgia trip through the best parts of the genre—comes Memoria, a follow-up to their 2011 adventure The Dark Eye: Chains of Satinav. Both games are based on Germany’s most popular pen-and-paper role-playing game, Das Schwarze Auge, or, as it’s known in English, The Dark Eye. Think Dungeons & Dragons but, y’know, German. Set in The Dark Eye’s pastoral world of Aventuria, Satinav introduced us to Geron, a negative and whiny bird-catcher turned hero. In the sequel, you get to play through the same village with the same character cracking similar jokes to townsfolk, many of which you’ve already met. Fun times. The concern with Geron from the outset is that he has little reason for staying in the town. Even after saving the world in the last Dark Eye game citizens and neighbors still look at him with disdain. They’re wary of magic, and now, after a new string of mysterious attacks in the forest turned some would-be robbers into stone, Geron is boxed in even more by their suspicion. His only purpose now is to turn his love Nuri from a raven back to her former self. 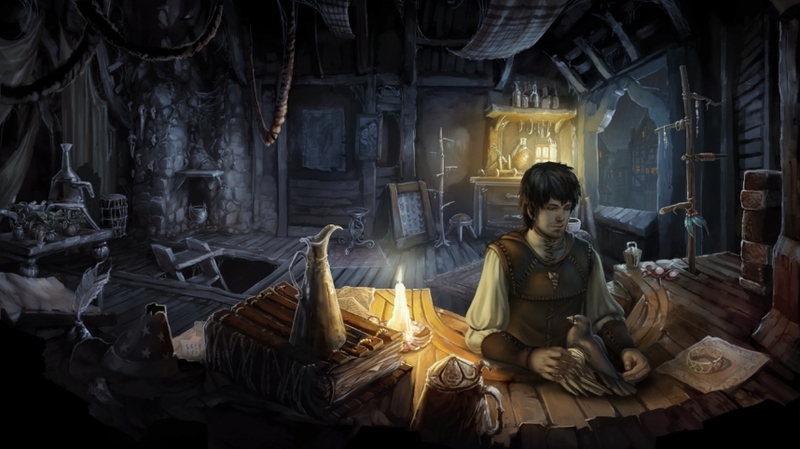 The first chapters of the game involve Geron trying to solve a riddle that he received from a traveling merchant. Once he solves the riddle, he can get Nuri back. The problem is that nobody is giving him answers. Also, besides one destruct and restore spell, he can’t perform any magic without drawing suspicion. Life moves slow here, both for Geron and the player.